Tense cold war film has Richard Widmark as the captain of a guided missile destroyer playing a potentially dangerous and lethal game of cat and mouse with a Soviet submarine off the coast of Greenland. 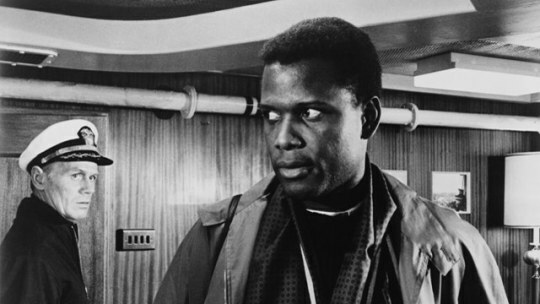 Widmark's Captain is being watched by a reporter played by Sidney Poitier who is supposed to be doing a story about life on board the destroyer. Things quickly escalate as Widmark's toying creates a dangerous situation as his men are not allowed a moment to relax and the submarine is not given a chance to replenish it's oxygen. Based on a novel which had it'sorigins in several incidents that almost brought the world an atomic war THE BEDFORD INCIDENT is a cold war tale that is incredibly tense and black as night. This is a film that shows very clearly the dangers of taking ones ideology too far. Widmark's captain very clearly wants the Soviets done awa with and he is willing to push things too far to make his point. More a dark warning along the more along the lines of FAIL SAFE rather than say DR STRANGELOVE this film would make a hellish double feature with the former film. (Though if you added ON THE BEACH you'd have a triple feature where the audience killed itself at the end). This is not a happy movie and by the time it ends you feel beaten up. I remember seeing the film for the first time a number of years ago and being completely unaware of what it was about or where it was going. By the time the film ended I felt like I had been hit by a bus. Bleakness of purpose aside this is a killer film and is a must see for anyone who wants to have a great deal to think about when the film is done.